A left anterior hemiblock (left anterior fascicular block) will change the depolarization progression and create left axis deviation when there is no other reason for it like LVH or an inferior AMI. The QRS complex axis will typically be between -45 and -60 degrees. Additional findings will include a qR pattern in the lateral (I and aVL) leads and an rS pattern in the inferior (II, III and aVF) leads. Lastly, there will be a delayed intrinsicoid deflection in lead aVL (> 45 msec). This is also called the R wave peak time. 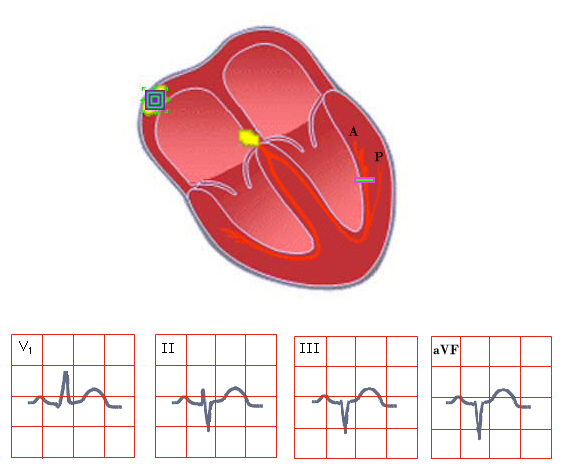 The intrinsicoid deflection is measured from the beginning of the QRS complex to the peak of the R wave and represents the depolarization vector from the endocardium to the epicardium.